Although compliance adds to expenditure of organizations, it must be bore in mind that non-compliance will result in greater losses incurred by regulatory fines as well as a tarnished image. To make compliance a serious work process regulatories have even multiplied the fines over the recent past. Joining the cause are also business stakeholders that have started demanding regular compliance audit reports. Off lately, it has been noted in well performing companies that compliance adherence also delivers better productivity that non-complying counterparts. In this scenario, a distinguished panel of prominent CEOs, CIOs, VCs, and analysts, along with the CIOReview’s editorial board has assessed hundreds of compliance solution providers and shortlisted the ones that are at the forefront of providing cutting-edge technology solutions. The listing provides a look into how the solutions in this domain are put into use, so that you can gain a comprehensive understanding of how they will optimize business processes. 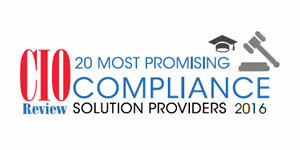 We present to you 20 Most Promising Compliance Solution Providers 2016.